"To Dance Is To Live!" Perhaps most people think of a bridal portrait session as a southern tradition. Maybe it is but more and more of our northern friends are having one as well. We like to think of it as a dress rehearsal where you have fun, and end up with a beautiful, elegant wall portrait. What are you gonna do with that you ask? After displaying their bridal portrait at their reception, many brides give this portrait to their Mom as a gift the day of their wedding. The day of your session, you'll have your hair and make-up done, put on your wedding dress, shoes, veil, jewelry, etc and you'll have a bouquet at least similar to the one you'll carry on your wedding day. It's a great time to make sure that you love the way you hair and make-up looks, to try your fabulous dress back on and ensure that you and your florist have the same thoughts in mind. It's also a wonderful time to get to know your photographer a little better. Remember, the more comfortable you are with your photographer, the better your portraits will be. 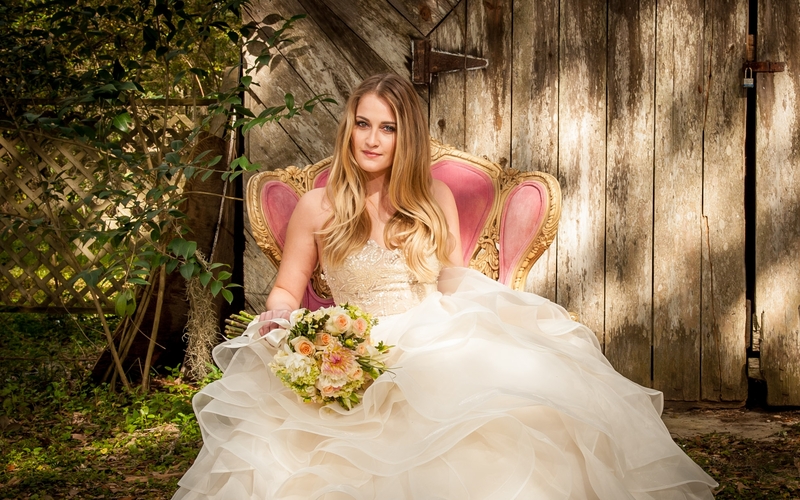 A bridal portrait session with Wayne's View Photography lasts approximately 2 hours and can be done at your favorite outdoor location or in-studio. We recommend that you schedule your session to take place no later than 4 to 6 weeks prior to your ceremony. Plan to bring someone with you and enjoy being pampered. Click HERE to schedule your bridal portrait session now. © 2004-2018 Wayne's View Photography, Inc.